I have recently acquired two kitchen appliances that I’m obsessed with: an automatic bread maker and a food dehydrator. As you know, I like to bake my own bread. While the bread maker actually takes longer from start to finish than it takes me to crank out a loaf manually, I like being able to dump in my ingredients, push Start, and forget about it. My bread maker came with a recipe book that has inspired many variations on my standard bread formula. 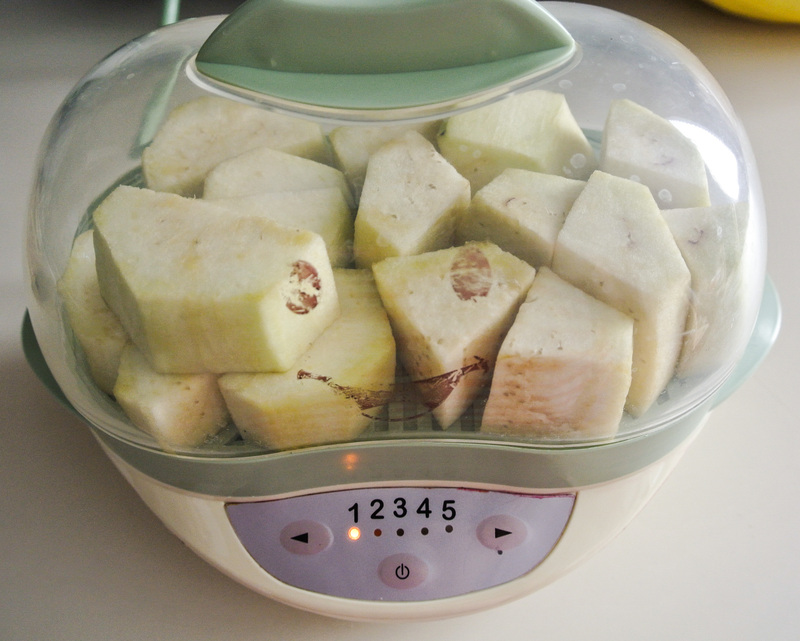 Today’s variation incorporates tomatoes that I dehydrated with my other favorite new appliance, my dehydrator. I asked for one for Christmas mainly to make my own dried fruit. Buying it premade often means signing up for excess added sugar, oil, or salt. I’m happy that I can now control those ingredients myself. The dehydrator also makes veggie chips, all-natural fruit rollups, and all kinds of other yumminess! Ok, back to the bread. I played around with my bread formula to come up with a loaf that incorporates all of the flavors of pizza without the cheese. This rendition incorporates a bit of nutritional yeast flakes (also found in my last post, nacho “cheese”) that really do add that much-sought-after cheesy flavor. You’ll notice that I’ve included the directions for making the bread by hand, should you not own a bread maker. Otherwise, follow the instructors on your appliance. 🙂 Enjoy! 3-4 cups of flour, plus more for dusting your workspace–> I’m using 2 cups whole wheat flour, 1 ¾ cups bread flour, and ¼ cup nutritional yeast (nooch is not flour, but has a similar dry consistency). ¼ cup ground flaxseed –> I’m using hulled hemp seeds instead. ½ tsp salt –> I’m using pink Himalayan sea salt. 1 tbsp oil –> I’m using some of the extra virgin olive oil that my sundried tomatoes are packed in. 1 ¾ cups very warm water (hot, but touchable) –> My bread machine requires less water, so I’m using only 1 ¼ cups, but I would maintain this amount for a manual loaf. Up to ½ cup specialty ingredients (optional) –> I’m using nearly ½ cup chopped sundried tomatoes + 1 tsp turbinado sugar, ½ tsp dried basil, and ½ tsp dried oregano. Attach a dough hook to your stand mixer (you can make the bread entirely by hand, but it will be a little workout!). Thoroughly clean and dry your countertop and sprinkle with flour. Have any specialty ingredients of choice nearby to eventually knead into your bread dough. Lightly oil a large bowl and a loaf pan. Combine 3 cups of flour (including nooch, in my case), salt, and yeast in the mixer on low. Add any additional spices or sweeteners, if using. Add the water and oil to the dry ingredients and scrape down the sides of the mixing bowl before starting the mixer. Start on low speed and increase the speed as the dry ingredients become incorporated into the wet. Add all of the flaxseed (hemp seeds in my case) and then, additional flour gradually until your dough forms a minimally sticky ball on high speed. I can tell that the dough is ready for kneading if it is still somewhat sticky to the touch, but does not stick to the mixing bowl itself when whipping around on a high speed. Flour your hands, remove the dough, and place the dough onto your floured countertop. Knead the dough, adding small amounts of flour as necessary, until it makes a smooth ball. If you are adding ingredients like sundried tomatoes, stretch the dough open 3 times throughout the kneading process to sprinkle in ingredients before folding over the dough and kneading again. Knead for 5-7 minutes total and then place the ball into your oiled bowl. Cover with a clean towel and let it rise in a warm place for 45 minutes. After 45 minutes, punch down the dough, reform into a loaf shape, and transfer it into your oiled loaf pan. Cover the dough and preheat your oven to 400 degrees. In the time that it takes the oven to preheat, your dough will rise again and then be ready for baking. Bake for 35 minutes. The bread should come out of the loaf pan fairly easily and onto a wire rack to cool. Need more pictures of the bread making process? Check out my original bread post! Pesto is easy to make and super flavorful. 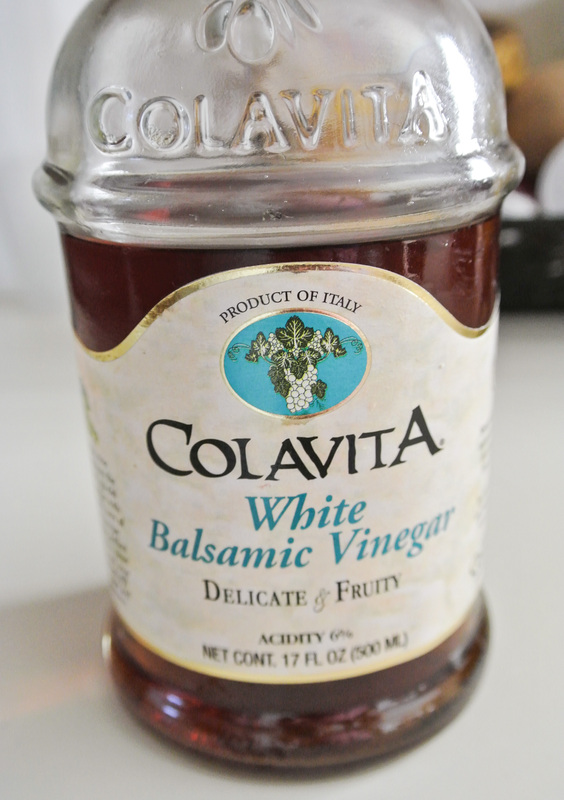 While it is quite commonly a sauce for pasta dishes, it can also be used as a spread for sandwiches and wraps or a dip or marinade for vegetables. Depending on the application, pesto may be best used immediately as it will change in consistency once it goes into the fridge. This is a result of the oil within solidifying. If you’re looking for the pesto to be “pourable,” use it right away. Otherwise, it can easily keep in the fridge for up to a week. There are endless combinations that make pesto delicious and versatile. The flavor depends largely on the herbs selected. Thus, I believe that pesto follows a basic formula and although often made with cheese, I’ve found a way to make it “cheesy” and vegan at the same time. 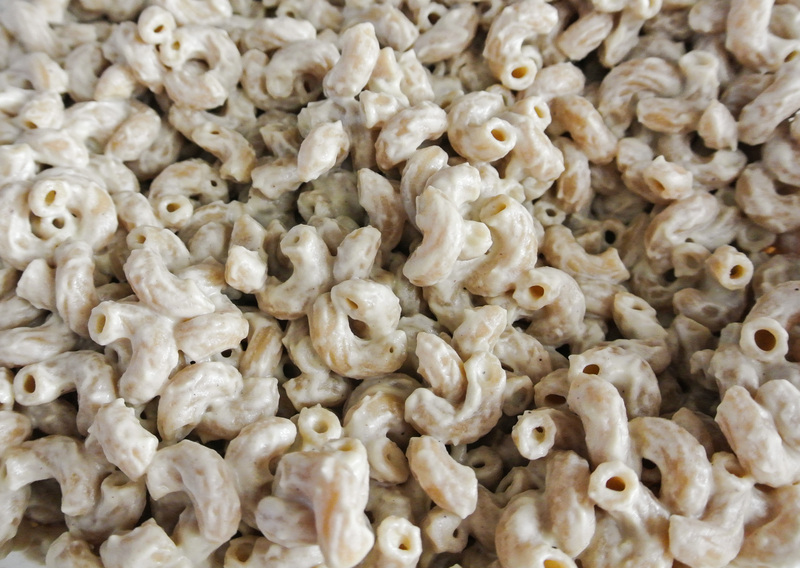 Ummm…what is nooch (pictured above)?! 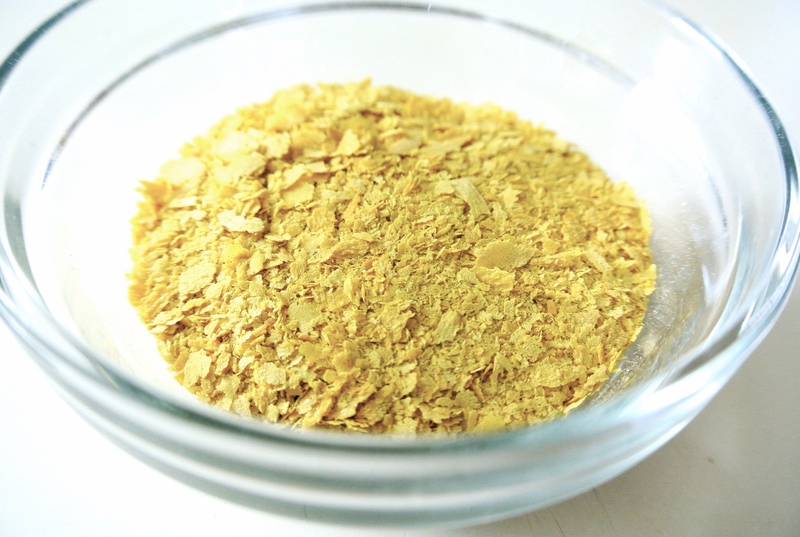 Originally named “nutritional yeast,” it is a member of the fungi family and not the same as say, brewer’s yeast or baking yeast. This strain of yeast has a cheesy, nutty taste and adds a lot of flavor to dishes in small amounts. Most importantly, it is called nutritional yeast for a reason. 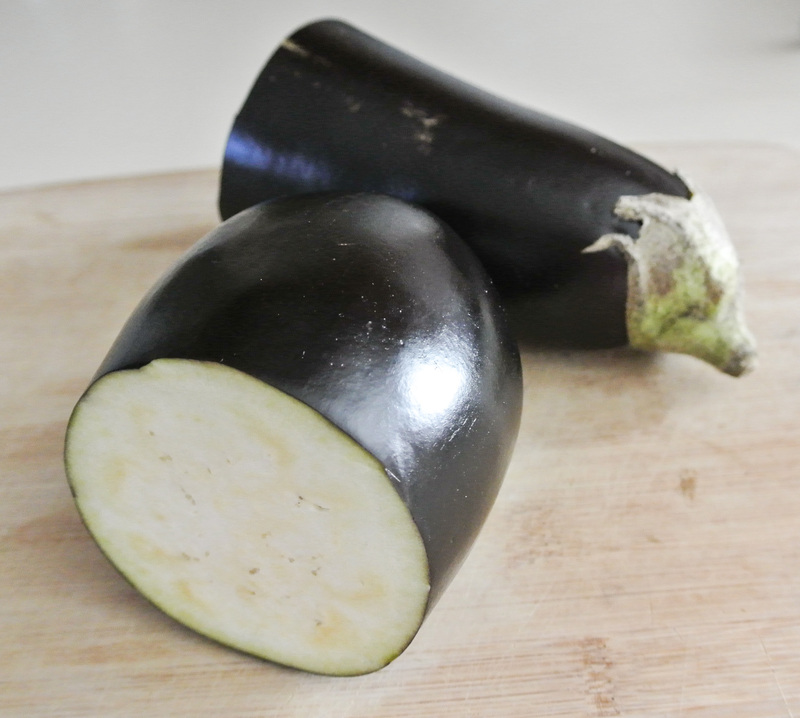 Nooch is loaded with B-vitamins, protein, zinc, folic acid, and selenium. To sweeten the deal, some brands specifically contain the highly sought out vitamin B12. 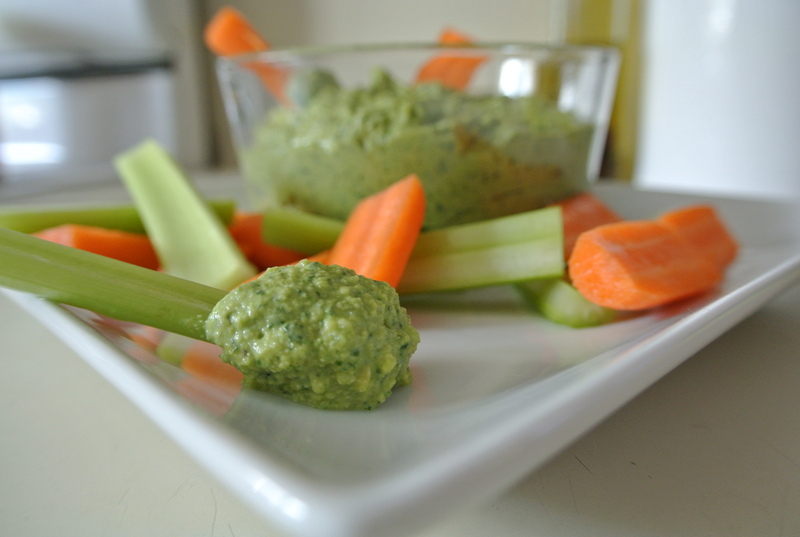 Be creative in experimenting with my pesto formula. You could make a cilantro version to spread inside burritos or tacos, a basil version for Italian cooking, or even a mint version to use with falafel. The possibilities are endless. Enjoy! 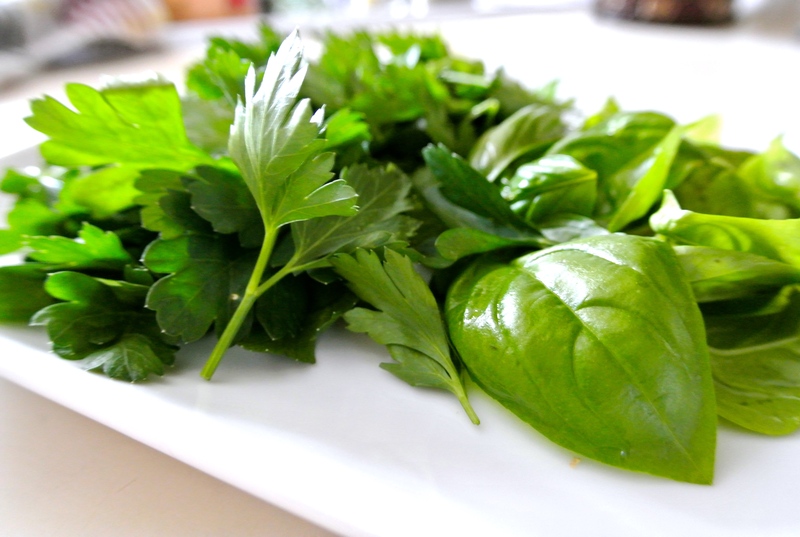 1 ½ cups fresh herbs –> I’m using 1 cup parsley and ½ cup basil. ½ cup citrus juice –> I’m using the juice of two lemons. 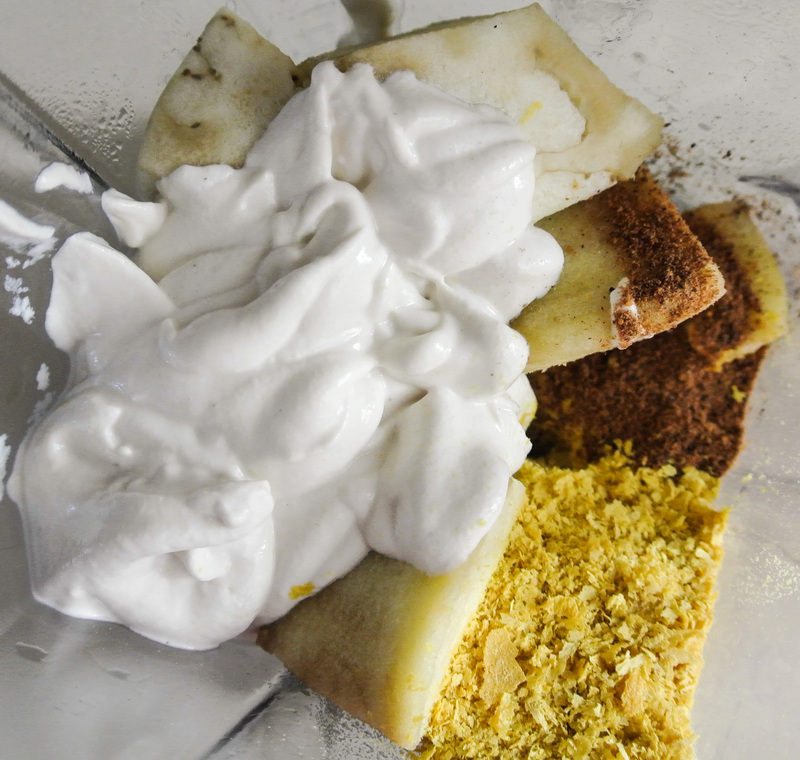 Additional spices (optional) –> I’m using 1 tsp onion powder. Water/oil as needed for smoothness –> I’m going for a thicker dip/spread, so I won’t need any extra liquid today. 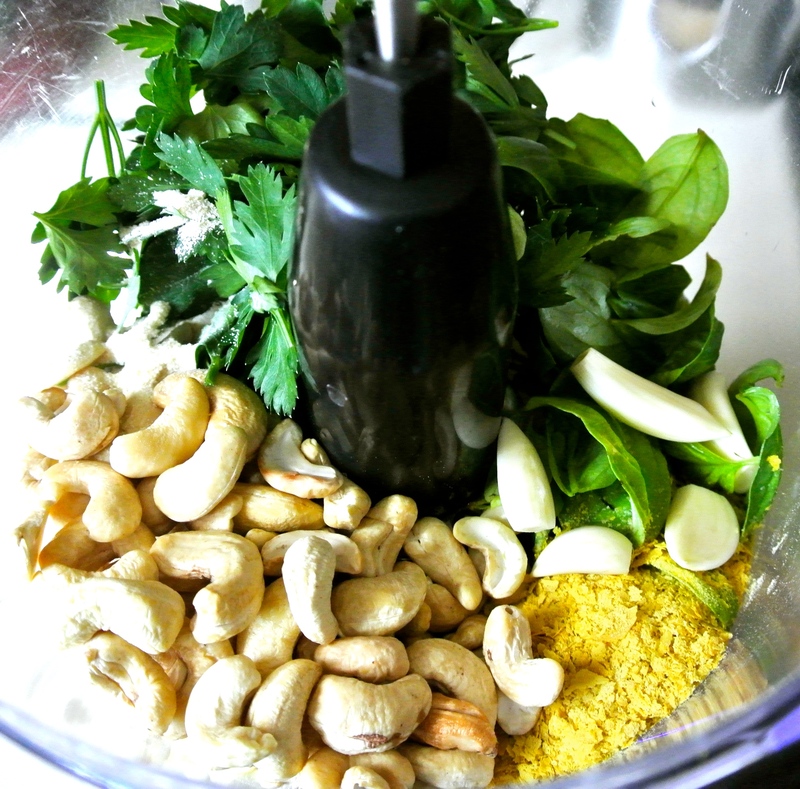 Combine all ingredients in a food processor and blend until smooth, adding water and/or oil as needed. The less oil used, the lower in fat the end product will be. 🙂 So flavorful, this pesto doesn’t even need salt!